During a recent training run, Katelyn, a fellow runner in Pittsburgh told me she signed up for the Nittany Valley Half Marathon! 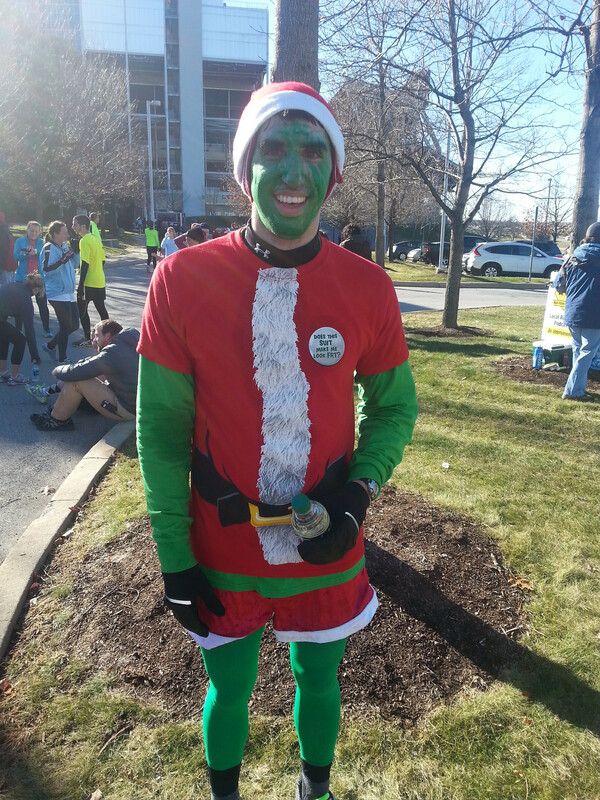 This is a low-key marathon in State College, PA. As I love State College, I wanted to do it. After a long discussion (2 minutes) with my partner in crime over google talk, we were all set to go to this race. We did not take a hotel and drive directly from Pittsburgh to the race. An e-mail was sent the day before the race to indicate where to park. Also, the e-mail reported that this was a low-key race and there was no bag, swag or goodies as in other races. We parked at 0950am (the race starts at 1000am), head to the starting line and realized that … people have a bib on their shoes and you have to pick up a packet! The website or the e-mail never communicate anything about packet pick-up and we were picking our packet 2 minutes before it starts. Hopefully, the issue was clearly minor and were able to start. The race director took our packets so that we were able to run the race without having to carry our tee-shirts and get them at the finish! 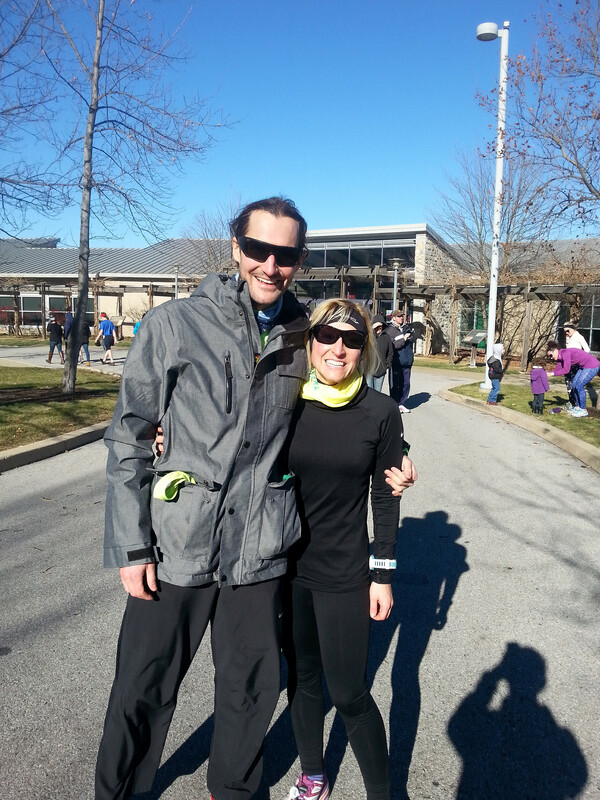 The race took place on December, 14 2014 and started at 1000am close to the Snyder Agricultural Arena. The course starts with two loops for about 2 miles and continues on the road until the end. It is mostly rolling hills with more incline sometimes but nothing really serious. Around mile 10, you pass by some beautiful areas with water spots (Spring Creek). If the weather is great, you can have a really good time there. Do not get me wrong, this is a very simple and basic course. Nothing really special but the Race Director is friendly, there is not a big crowd and if you are looking for a easy relaxing course, this is definitively a good option to finish the year! There are three or four water stops that offer mostly water and gatorade. I did not pay attention at what is offered because I do not take anything for such short distance. If you are worried about stopping to the bathroom, there was bathrooms located at the aid station around mile 8. On the other hand, one great surprise during this race was the (probably unofficial) beer stop at mile 12. I saw some friends from the trail community and I was pretty happy to see these guys! I did not take any nutrition or fluids during the race except at this stop! Once you finish, you can go to the packet pick up site (Snyder Agricultural Arena) where the award ceremony/post-race party takes place. Food is available (Subway is a sponsor) and you can hang out for a while with fellow runners. There are also bathrooms available at the finish line in case you want to change your clothes. 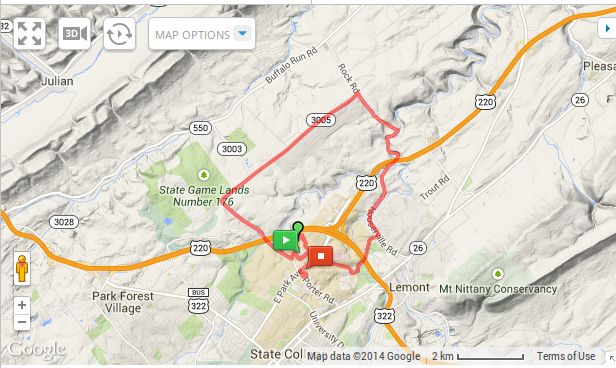 Well, this is a very simple and friendly race around State College. You never go off the road but you hit some beautiful spots on the area. Even if this race is not very special, you can do it as a good supported training run. Considering the price, this is definitively reasonable and, if you never visited State College, this might be a good opportunity to visit the city as well! If you end up doing that, consider passing by Happy Valley Brewing, they have a good draft list and good food options, perfect to replenish the batteries! I have never ran this one before but a friend of mine ran it this year and she says it was a very hilly and difficult course. I think next year I will do it. Well, the way you feel the elevation depends on your actual training. If you are ok with the hill of the Pittsburgh marathon, you will be totally fine! If you run some trails regularly, you will be more than fine! But if you are used to flat roads, you can have problems. I would recommend this course as a good training: this is close to Pitt, friendly, why not doing it then?